This article is about postal services. 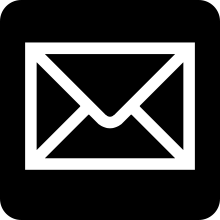 For electronic mail, see Email. For other uses, see Mail (disambiguation) and Postal service (disambiguation). 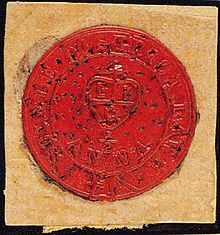 The use of the Scinde Dawk adhesive stamps to signify the prepayment of postage began on 1 July 1852 in the Scinde/Sindh district, as part of a comprehensive reform of the district's postal system. In South India, the Wodeyar dynasty (1399—1947) of the Kingdom of Mysore used mail service for espionage purposes thereby acquiring knowledge related to matters that took place at great distances. By the end of the 18th century, the postal system in India had reached impressive levels of efficiency. According to British national Thomas Broughton, the Maharaja of Jodhpur sent daily offerings of fresh flowers from his capital to Nathadvara (a distance of 320 km), and they arrived in time for the first religious Darshan at sunrise. Later this system underwent complete modernization when the British Raj established its full control over India. The Post Office Act XVII of 1837 provided that the Governor-General of India in Council had the exclusive right of conveying letters by post for hire within the territories of the East India Company. The mails were available to certain officials without charge, which became a controversial privilege as the years passed. On this basis the Indian Post Office was established on October 1, 1837. By the end of Kublai Khan's rule, there were more than 1400 postal stations in China alone, which in turn had at their disposal about 50,000 horses, 1,400 oxen, 6,700 mules, 400 carts, 6,000 boats, more than 200 dogs, and 1,150 sheep. The stations were 25 to 65 km (16 to 40 mi) apart and had reliable attendants working for the mail service. Foreign observers, such as Marco Polo, have attested to the efficiency of this early postal system. The first airmail flight in Germany, 1912. Documents should generally not be read by anyone other than the addressee; for example, in the United States of America it is a violation of federal law for anyone other than the addressee and the government to open mail. There are exceptions however: executives often assign secretaries or assistants the task of handling their mail; and postcards do not require opening and can be read by anyone. For mail contained within an envelope, there are legal provisions in some jurisdictions allowing the recording of identities of sender and recipient. The privacy of correspondence is guaranteed by the constitutions of Mexico, Colombia and Brazil, and is alluded to in the European Convention on Human Rights and the Universal Declaration of Human Rights. The control of the contents inside private citizens' mail is censorship and concerns social, political, and legal aspects of civil rights. International mail and packages are subject to customs control, with the mail and packages are often surveyed and their contents sometimes are edited out (or even in). There have been cases over the millennia of governments opening and copying or photographing the contents of private mail. Subject to the laws in the relevant jurisdiction, correspondence may be openly or covertly opened, or the contents determined via some other method, by the police or other authorities in some cases relating to a suspected criminal conspiracy, although black chambers (largely in the past, though there is apparently some continuance of their use today) opened and open letters extralegally. This epoch[when?] is undoubtedly mainly dominated by mechanical writing, with a general use of no more of half a dozen standard typographic fonts from standard keyboards. However, the increased use of typewritten or computer-printed letters for personal communication and the advent of email have sparked renewed interest in calligraphy, as a letter has become more of a "special event". Long before e-mail and computer-printed letters, however, decorated envelopes, rubber stamps and artistamps formed part of the medium of mail art. In the 2000s (decade) with the advent of eBay and other online auction sites and online stores, postal services in industrialized nations have seen a major shift to item shipping. This has been seen as a boost to the system's usage in the wake of lower paper mail volume due to the accessibility of e-mail. Le Philateliste by François Barraud (1929). First-Class Mail in the U.S. includes postcards, letters, large envelopes (flats), and small packages, providing each piece weighs 13 ounces (370 g) or less. Delivery is given priority over second-class (newspapers and magazines), third class (bulk advertisements), and fourth-class mail (books and media packages). First-Class Mail prices are based on both the shape and weight of the item being mailed. Pieces over 13 ounces can be sent as Priority Mail. As of 2011 42% of First-Class Mail arrived the next day, 27% in two days, and 31% in three. 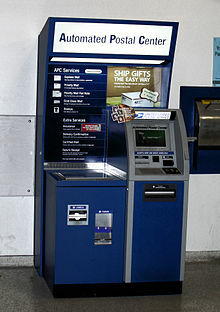 The USPS expected that changes to the service in 2012 would cause about 51% to arrive in two days and most of the rest in three. The British Royal Mail equivalent to USPS First-Class Mail is stylized as 1st Class, and is simply a priority option over 2nd Class, at a slightly higher cost. Royal Mail aims (but does not guarantee) to deliver all 1st Class letters the day after postage. The Canada Post counterpart is Lettermail. In the United Kingdom recorded delivery mail (branded as signed for by the Royal Mail) is covered by The Recorded Delivery Services Act 1962. Under this legislation any document which its relevant law requires service by registered post can also be lawfully served by recorded delivery. This act states that any recorded delivery item is deemed to have been delivered at the instant it is posted if; (a) the item is delivered and signed for at the delivery address or handed over and signed for the at local sorting office (see (c)); (b) delivery is refused by any person occupying the address or (c) if the item is not collected from the sorting office within seven days following a non-delivery because there is no reply to the postman and he leaves a collection card. The sorting office will return the item to the sender after the seventh day. The sender should retain the item unopened as proof that the item has been delivered (at least in law if not in fact). Although much case law has attempted to undermine the provisions of the Act, it has done little but reinforce the point. This antique "letter-box" style U.S. mailbox is both on display and in use at the Smithsonian Institution Building. 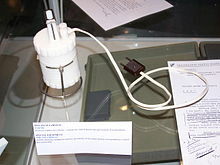 Hybrid mail, sometimes referred to as L-mail, is the electronic lodgement of mail from the mail generator's computer directly to a Postal Service provider. The Postal Service provider is then able to use electronic means to have the mail piece sorted, routed and physically produced at a site closest to the delivery point. It is a type of mail growing in popularity with some Post Office operations and individual businesses venturing into this market. In some countries, these services are available to print and deliver emails to those who are unable to receive email, such as the elderly or infirm. Services provided by Hybrid mail providers are closely related to that of mail forwarding service providers. 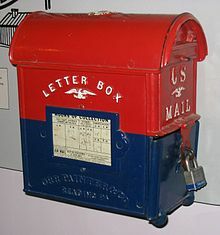 ^ In Australia, Canada, and the U.S., "mail" is commonly used both for the postal system and for the letters, postcards, and parcels it carries; in New Zealand, "post" is more common for the postal system and "mail" for the material delivered; in the UK, "post" prevails in both senses. 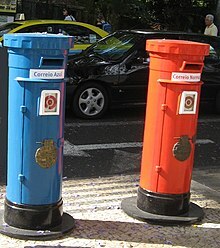 However, the British, American, Australian, and Canadian national postal services are called, respectively, the "Royal Mail", the "United States Postal Service", "Australia Post", and "Canada Post"; in addition, such fixed phrases as "post office" or "junk mail" are found throughout the English-speaking world. ^ "mail, n.2". Dictionary.com (Unabridged (v 1.1) ed.). 2007. Archived from the original on 2007-02-19. ^ Webster's Seventh New Collegiate Dictionary, G. & C. Merriam Company, 1963, pp. 662–63. ^ Universal Postal Union. "History". Accessed 2 October 2013. ^ Silverstein, Adam (2006). "Post, or Barid". In Meri, Josef W. (ed.). Medieval Islamic Civilization, An Encyclopedia, Volume 2: L-Z, Index. Leiden and New York: Routledge. pp. 631–632. ISBN 0-415-96692-2. ^ "Rowland Hill's Postal Reforms". The British Postal Museum & Archive. 2009-08-21. Archived from the original on 24 December 2014. Retrieved 27 December 2014. ^ Baldwin, N. C. (1960), p. 5, Fifty Years of British Air Mails, Francis J.Field Ltd.
^ "United States Code: Title 18, 1702. Obstruction of correspondence". Legal Information Institute of Cornell University Law School. Archived from the original on September 4, 2010. Retrieved September 14, 2010. ^ a b c Back when spies played by the rules Archived 2007-03-11 at the Wayback Machine, Deccan Herald, January 17, 2006. Retrieved 29 December 2006. ^ "Significant Years in U.S. Postal History". United States Postal Service. 2015. Archived from the original on 27 February 2015. Retrieved 13 May 2015. ^ "Treaties". Postal Matters. United States Embassy, Bulgaria. 25 June 1990. Archived from the original on 19 September 2015. Retrieved 13 May 2015. ^ "First-Class Mail". USPS. Archived from the original on 2011-10-15. Retrieved 2009-01-09. 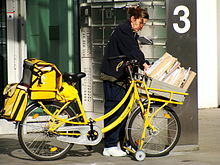 ^ "Postal service cuts mean slower mail in 2012". CBS News. Associated Press. 2011-12-05. Archived from the original on 8 October 2013. Retrieved 8 July 2013. ^ "Sending Mail". Royal Mail. Retrieved 2018-04-22. ^ "Lettermail". Canada Post. Retrieved 2018-04-22. ^ e.g. Railtrack Plc v Gojra, Kinch v Bullard and most recently Blunden v Frogmore Investments Ltd.
^ "Postal Service Helps Businesses "Stick" to their Message". 2005-04-05. Archived from the original on 2007-09-29. Retrieved 2007-07-17. ^ "Marketing 'Notes' Extended for Additional Year: U.S. Postal Service Governors Issue Decision on Repositionable Notes". 2007-07-06. Archived from the original on 2007-07-11. Retrieved 2007-07-17. ^ "Cut-Out Postcard – Postage Due". Members.aol.com. Archived from the original on 2006-03-09. Retrieved 2008-10-24. Aiyangar, Sakkottai Krishnaswami; S. Krishnaswami A. (2004). Ancient India: Collected Essays on the Literary and Political History of Southern India. Asian Educational Services. ISBN 978-0-8018-8359-0. Dorn, Harold; MacClellan, James E. (2006). Science and Technology in World History: An Introduction. Johns Hopkins University Press. ISBN 978-0-8018-8359-0. Heaton, J. Henniker (1905). "Imperial Postal Services" . The Empire and the century. London: John Murray. pp. 288–317. Mote, Frederick W.; John K. Fairbank (1998). The Cambridge History of China. Cambridge University Press. ISBN 978-0-521-24333-9. Peabody, Norman (2003). Hindu Kingship and Polity in Precolonial India. Cambridge University Press. ISBN 978-0-521-46548-9. Prasad, Prakash Chandra (2003). Foreign Trade and Commerce in Ancient India. Abhinav Publications. ISBN 978-81-7017-053-2. Look up mail or post in Wiktionary, the free dictionary. Wikivoyage has a travel guide for Postal service. 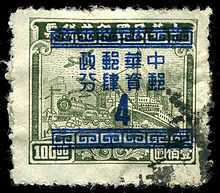 Wikimedia Commons has media related to mail. This page was last edited on 9 April 2019, at 02:52 (UTC).